After a frantic weekend of playing word count catch up, since I’d fallen quite far behind, due to one night of laziness, and the other nights filled with prior commitments, I was starting to believe those in my life who’d branded me rather lovingly, as “crazed” for taking on this challenge. Not in the “she’s hearing voices” way, but more in the sense of having a sudden madness descend over me, as I mutter away to myself and my characters in front of my laptop, all alone typing furiously away to the soothing sounds of a string quartet, as my wonderful husband brought me cup, after cup of coffee (he’s an angel!). The fact that I was a little over 10 000 words behind my word count goals at the start of the weekend, was what made me start to believe I would never finish the challenge on time, though I was determined to keep trying. And yes, this calls for a big le sigh at my time management (or ‘slight’ lack thereof). You don’t know me yet, and I hope you will through my blogging journey on Rambling with Rose, but other people have often said, with a slight twinkle in their eye, that I can be surprisingly stubborn. I, however, like to think of myself as persevering despite seemingly insurmountable odds – because in my mind, if you never try, and just give up, you’ll never know. This was actually what gave me a push in the direction of a hidden reservoir of inspiration, strength and patience within me, that allowed me to weather power failures (thanks Eskom), having my darling (noisy) niece round, and my poor little laptop dying on me quite suddenly (which led to a frantic trip home on Friday night to my fantastic family – my father figured out after poking around, that the problem was with my power cord, not the actual laptop). 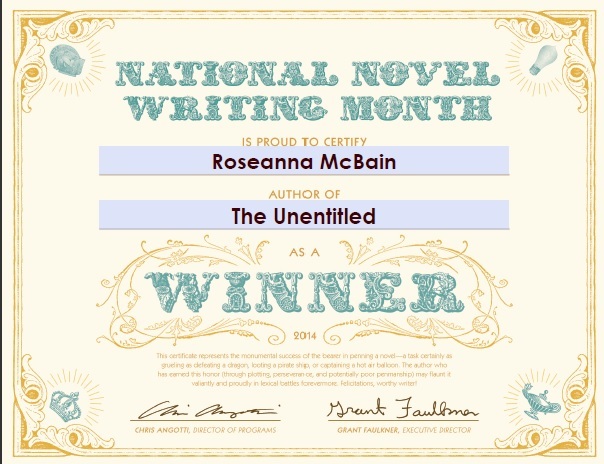 All that aside, I can proudly state that I am, as of this afternoon, a 2014 NaNoWriMo winner! Right now, I feel giddy with happiness and am on top of the world (as in I can move mountains, or rather, that I’m a Big Damn Hero) for meeting this personal challenge. I can say, even with all the obstacles included, NaNoWriMo has been a very worthwhile endeavor. My excitement and happiness aside, how has your NaNoWriMo gone?